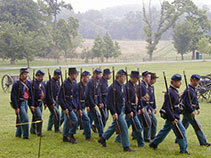 Donations to the Frederick County Civil War Roundtable are tax deductible. We have IRS 501 (c) (3) status and validation is available. The Frederick County Civil War Roundtable is incorporated in Maryland as a not-for-profit organization. Donations are used to support the program further the mission of the organization.